The Athos ® wearable system integrates surface electromyography (sEMG ) electrodes into the construction of compression athletic apparel. The Athos system reduces the complexity and increases the portability of collecting EMG data and provides processed data to the end user. The objective of the study was to determine the reliability and validity of Athos as compared with a research grade sEMG system. Twelve healthy subjects performed 7 trials on separate days (1 baseline trial and 6 repeated trials). In each trial subjects wore the wearable sEMG system and had a research grade sEMG system’s electrodes placed just distal on the same muscle, as close as possible to the wearable system’s electrodes. The muscles tested were the vastus lateralis (VL), vastus medialis (VM), and biceps femoris (BF). All testing was done on an isokinetic dynamometer. Baseline testing involved performing isometric 1 repetition maximum tests for the knee extensors and flexors and three repetitions of concentric-concentric knee flexion and extension at MVC for each testing speed: 60, 180, and 300 deg/sec. Repeated trials 2-7 each comprised 9 sets where each set included three repetitions of concentric-concentric knee flexion-extension. Each repeated trial (2-7) comprised one set at each speed and percent MVC (50%, 75%, 100%) combination. The wearable system and research grade sEMG data were processed using the same methods and aligned in time. The amplitude metrics calculated from the sEMG for each repetition were the peak amplitude, sum of the linear envelope, and 95th percentile. Validity results comprise two main findings. First, there is not a significant effect of system (Athos or research grade system) on the repetition amplitude metrics (95%, peak, or sum). Second, the relationship between torque and sEMG is not significantly different between Athos and the research grade system. For reliability testing, the variation across trials and averaged across speeds was 0.8%, 7.3%, and 0.2% higher for Athos from BF, VL and VM, respectively. Also, using the standard deviation of the MVC normalized repetition amplitude, the research grade system showed 10.7% variability while Athos showed 12%. The wearable technology (Athos) provides sEMG measures that are consistent with controlled, research grade technologies and data collection procedures. Surface electromyography (sEMG) provides access to the activation signal that causes the muscle to generate force, produce movement, and accomplish the essential functions of everyday life (DeLuca, 1997). The sEMG signal represents the sum of the motor unit action potentials recorded by the electrodes and provides crucial insight into the nervous system’s activation of the muscle (Day and Hullinger, 2001; Keenan et al., 2005). sEMG is used in various applications including clinical, research and sport to explore the neuromuscular system and the relationship between muscle activation, movement and force. For example, sEMG provides clinicians with a robust biofeedback tool that has been demonstrated to improve muscle function in children with cerebral palsy (Bloom, 2010). Moreover, sEMG has been effective in diagnosing, treating and researching populations with various pathologies including hypo- and hypertonicity (Herrington, 1996); stroke (Park and Kim, 2017); lower back pain (Kaur and Kumar, 2016; Matheve et al., 2017); and patellofemoral pain syndrome (PFPS) (Kalytczak, 2016). The research applications of sEMG are also broad and include detecting differences in muscle activation patterns with changes in exercise or movement technique (Lynn and Noffal, 2012; Lynn and Costigan, 2009), recognizing abnormal activation strategies (Michener et al., 2016), developing methods for prosthetic control (Daley et al, 2012), as well as developing biomechanical models to predict the loading on joints (Callaghan et al., 1998). Movement strategy is critical in sport and sEMG has been used to evaluate muscle activation in sport applications including recovery, performance and evaluating injury risk factors. As a biofeedback tool, sEMG has been demonstrated to increase quadriceps strength recovery post anterior cruciate ligament (ACL) reconstruction (Draper, 1990). Further, muscle activation based on sEMG has been used to evaluate the efficacy of different training techniques such as comparing the activation from different muscle groups based on exercise or equipment type (Krause, 2009) or evaluating the impact of training technique on specific physiological adaptation (Walker, 2012). Muscle activation data has also been used to research criteria that may relate to different injury risk in sport, for example, quadriceps dominance during single leg squats as a possible risk indicator of ACL injury (Zeller, 2003). Although the clinical, research and sport applications of sEMG are extensive, there are many hurdles that make it difficult for wide ranging use. Measurement of sEMG typically requires significant setup cost including skin preparation and application of single use adhesive-based Ag/AgCl electrodes (SENIAM) (Merletti, 1997). Also, electrodes are generally tethered to a data acquisition system constraining the movement of the subject and context that can be studied. Further, the signal acquired often requires further processing and filtering by the user to report on metrics based on the data. The setup cost and complexity of the equipment as well as the extensive processing often required makes sEMG analysis and application difficult outside the laboratory or clinic. With advancements including component miniaturization, material development and improved manufacturing methods, new technologies for measuring human physiology are emerging that may reduce the setup cost and complexity of measuring sEMG. The Athos® training system (www.liveathos.com) is an example of one of these new technologies. Athos has integrated sEMG measurement into the construction of athletic compression apparel. The sEMG signals are acquired by a portable device that clips into the apparel, processes, and sends wirelessly to a client device for presentation to the coach or athlete. Through the combination of a mobile and browser application, Athos provides athletic trainers, coaches and athletes with performance metrics derived from the sEMG measurements. The sEMG based metrics are used to evaluate activation and recruitment patterns between muscles and over time during training. While Athos provides sEMG measurements integrated into the construction of compression athletic apparel, the validity and reliability of this system needs further testing. One study has compared the Athos sEMG signal to a research grade system (Aquino & Roper, 2018) and found it to be valid; however, the two sEMG systems were not worn concurrently, so data from the same contractions could not be compared. Therefore, the purpose of this study is to compare Athos sEMG measurements against an established research system and protocol (Finni et al., 2007) on the same contractions. Athos electrodes are integrated into the construction of the garment. The research system comprises traditional Ag/AgCl adhesive electrodes placed directly distal the Athos electrodes and following standard SENIAM protocol for skin preparation. There was no difference in filtering applied prior to sampling across the EMG spectrum of 10-500 Hz and the sampled signals were processed using the same processing steps. The validity of the Athos system was evaluated by first comparing characteristics of the sEMG signal from both systems and second by comparing the relationship between sEMG from both systems and the resulting torque produced by those contractions. We evaluated the reliability of sEMG measures from the two systems across days where the electrodes are re-applied. We hypothesized that there would be no significant differences in sEMG output or the relation between EMG and torque for the two systems. Moreover, we hypothesized that the test-retest reliability of the sEMG signal from Athos would be comparable to the research grade system. Subjects Twelve healthy subjects (6 males, 6 females, see Table 1) were recruited for this study. Subjects were screened through a pre-research questionnaire to determine level of training and ensure full commitment to the completion of data collection. Level of training was defined as untrained (< 1 year training; 1 male, 3 female), recreationally trained (1-3 years training; 3 male, 3 female) and expertly trained (> 3 years training; 1 male, 1 female). Testing was performed at the same time for each testing trial, and subsequent trials were separated by a minimum of 48 hours. Each subject was required to participate in a total of seven testing trials over a three-week period. All subjects were notified of potential risks and provided written informed consent approved by the University Institutional Review Board prior to data collection. Set-up For each subject, anthropometrics (hip and waist measurements) were recorded to determine the appropriate Athos gear size. Each subject used the same gear throughout the whole study, and gear was washed following the last trial of each week. SEMG measurements from the vastus lateralis, vastus medialis and bicep femoris were collected with both Athos and the Biopac electrodes (Biopac Systems, Inc., Goleta, California) simultaneously. The Athos compression garments were fit to each subject to ensure the electrodes embedded in the garments were directly over the muscle bellies of vastus lateralis, vastus medialis, and biceps femoris. Athos electrodes are designed to provide a bipolar differential EMG measurement with an interelectrode distance of 2.1 cm (Figure 1). Athos electrodes are comprised of a conductive polymer and no skin or electrode preparation was performed at the site corresponding to each electrode. No skin or electrode preparation was performed at the site corresponding to each Athos electrode as in a practical setting, skin preparation is not performed when wearing Athos. For each muscle, the Athos shorts were cut just below the Athos bipolar electrodes to place the Biopac bipolar electrodes (Biopac EL500, Ag/AgCl electrodes, Bio-Pac systems Inc., Goleta, CA, USA) as close to the Athos electrodes as possible and directly distal on the same muscle. The bipolar Biopac electrodes provided a differential EMG measurement and an interelectrode distance of 2.1 cm was used to match the interelectrode distance of the Athos electrodes. When applying Biopac electrodes, the area of skin was shaved and cleaned with an alcohol wipe. Biopac electrodes were marked on the skin and the electrode location was re-marked following testing to prevent fading and keep the placement consistent for each trial. The Biopac reference electrode was placed on the right wrist at the styloid process of the ulna as has been done previously (Cochrane et al., 2014). Experimental procedure The study protocol consisted of 1 baseline testing session and 6 repeated testing sessions (Figure 2). A HUMAC Norm (CSMi, Inc., Stoughton, MA, USA) isokinetic dynamometer was used to control the knee extension and flexion sets and to measure angular displacement and torque output. The dynamometer was used to reduce variability in the performance of the movement by controlling for speed and movement position. Torque output measurements were taken to control for repeatable torque across trials and to relate the output torque to the resulting sEMG response for each muscle. Day 1: Familiarization and Baseline Testing: Prior to the first data collection trial, height and mass were recorded. Subjects were instructed to cycle for 10-minutes on a stationary bike at a self-selected pace followed by a dynamic warm-up. Subjects were then seated on the HUMAC Norm dynamometer and were positioned according to the HUMAC testing and rehabilitation user’s manual with the padded arm of the dynamometer positioned 3 cm proximally to the lateral malleolus and the axis of rotation of the knee aligned with the axis of rotation of the dynamometer. Isometric 1 repetition maximum (RM) strength testing for knee extensors and knee flexors was performed with the knee positioned at 90° of flexion and the hip at 85° as was previously described (Luc et al., 2016; Roberts et al., 2012). All tests included familiarization comprising warm-up repetitions to become familiar with each speed and movement. The isometric protocol to determine each subject’s 1RM consisted of 5 second isometric contractions intermittent with 5 seconds of rest at each intensity, starting at 50 percent MVC for 5 repetitions, 70 percent MVC for 3 repetitions, 90 percent MVC for 1 repetition, and 100 percent for 1 repetition. A 1-minute rest followed each effort set. Following isometric testing, subjects performed three repetitions of concentric-concentric knee extension and flexion at 100 percent MVC for each testing speed: 60, 180, and 300 deg/sec. Each of these repetitions involved moving the knee from 90° of flexion to 0° of knee flexion, or where the knee is fully extended and back to 90° of flexion. The peak torque achieved by the subject during each set was recorded and used to establish a +/-10% torque window for each speed and percent MVC for the following 6 trials of the study. Any subsequent trials which produced torque values outside of this range were not counted and repeated. Days 2-7: Subjects were asked to attempt to maintain consistent patterns of sleep, nutrition, and activity between testing days. Prior to each trial, subjects completed a daily questionnaire consisting of sleep, nutrition, and activity information in order to ensure there were no large differences in these factors that could alter performance. Participants performed the standardized cycling and warm up protocol. Each trial consisted of 9 sets (Figure 2) with each set consisting of 3 knee extension and flexion repetitions. The 9 sets included 1 set per speed (at 60 deg/s, 180deg/s, and 300 deg/s) and MVC level (50 percent, 75 percent, and 100 percent) combination. Concentric torque, position, velocity and sEMG data were collected during each set. Effort levels were monitored based on the 1RM peak torque established during day 1 baseline testing for each subject, speed and MVC combination. The research administrator examined data after each set to determine if the effort level achieved matched the baseline torque outputs (within +/- 10%). If torque output was outside the approved range, the participant was required to attempt testing at that speed-effort pairing again and no more than 3 attempts were made before moving to the next pairing. The order of 9 sets was randomized between participants, but each participant performed the same order for all six testing sessions. Athos provided sampled sEMG data at 1kHz, no gain was applied to the analog signal and only an anti-aliasing filter was applied prior to sampling. The anti-aliasing filter prevents high frequency noise greater than 500Hz from aliasing into the sEMG spectrum. Since the sEMG spectrum generally does not extend beyond 500 Hz the anti-aliasing filter will have negligible influence on the sEMG signal. Biopac data was sampled at 1024 Hz, the analog signal was amplified by a factor of 1000 and a bandpass filter with cutoff frequencies at 10 Hz and 500 Hz were applied prior to sampling (EMG100C; BIOPAC Systems Inc., Goleta, CA, USA; bandwidth = 10–500 Hz). After Athos and Biopac signals were sampled and aligned to 1kHz, both were processed with the same set of filtering steps to ensure an equivalent spectrum of the signal from each system and to produce an envelope representing the sEMG signal power. Filtering included a linear bandpass filter with center frequency at 120 Hz, linear notch filter at 60 Hz, rectification and linear envelope. The linear envelope was then downsampled by a factor of 25 and further smoothed using a 16 sample root mean square (RMS). The processing steps described above are supported as a method of calculating an amplitude representation of the sEMG signal and described in ‘Guidelines for Reporting SEMG Data’ (Merletti, 1997). The final result is an RMS sEMG from both systems at the same sampling rate. This is required to calculate reliability and validity. Athos data includes a measure of contact quality, which is estimated from the amplitude of a high frequency signal outside of the sEMG frequency spectrum. This signal was evaluated to determine the quality of contact of each of the Athos electrodes for each trial. Each set of data comprised knee extension and flexion repetitions at a given MVC level. If the amplitude of the high-frequency contact signal exceeded a given threshold for over 10% of the set, that set was determined to be poor contact quality. In total 18% of the sets were determined to have poor contact quality and were not included in further analysis. The Biopac sEMG data and HUMAC dynamometer data was collected with the same software (AcKnowledge, v.3.8.1, Biopac Systems Inc.) and were therefore aligned in time and at the same sampling rate of 1024 Hz. To align the Athos data to the Biopac and dynamometer data we compared the standard deviation from a 200 ms sliding window to the standard deviation of the resting noise (Dideriksen et al., 2017). The standard deviation of the resting noise was taken from the first second of each set during which the subject was stationary. The onset event of the first repetition was determined for the Athos system as the point where the sEMG standard deviation was 10x the magnitude of the standard deviation of the resting noise. The Athos onset event was then aligned to the moment where the dynamometer arm started to move. This produced the best alignment of the data from both systems. It is well established that sEMG activity precedes mechanical output or motion in the range of 50 ms (DeLuca, 1997), but we found this difference had negligible impact on alignment for the purpose of this study. After alignment a plot was generated for each set to visually evaluate the resulting Athos and Biopac alignment as well as to check for any other test issues. An example plot is shown in Figure 3, the processed envelope for both Athos (black) and Biopac (grey) are overlaid after the alignment has been corrected based on the above described method. For this example, it is possible that the Biopac electrode contact quality was lower than that of the Athos electrode for the bicep femoris muscle group. This difference in contact quality could explain the increase in baseline noise and lower signal amplitude measured from Biopac as compared to Athos for this set. and may be due to the fact the subjects were seated and there may have been some pressure on the hamstring electrodes. During visual inspection of each trial, 22% of the sets were removed from further analysis due to either incorrect alignment or errors in the testing methodology. Incorrect alignments were mostly due to trials where the subject was not fully relaxed when the data collection began, this resulted in large resting noise. Error conditions included recordings with less than 3 measured repetitions, cases where the subject was unable to achieve the desired speed or produced inconsistent speed across repetitions. After the datasets were aligned, parameters were calculated for each repetition based on the processed RMS of the sEMG signal. First the three repetitions of each set were segmented for the sEMG and torque time series data using the zero crossings of the dynamometer arm velocity. For each segmented repetition parameters were calculated as dependent variables for the processed RMS waveform of the sEMG signal including the 95th percentile magnitude, peak magnitude, and sum of the total sEMG over the repetition. The same parameters were also calculated for torque over each repetition. The 95th percentile and peak magnitude both represent a peak amplitude parameter taken from the processed sEMG waveform over each repetition with the 95th percentile magnitude more resilient to large magnitude sample outliers during the repetition. The sum represents the accumulation of the sEMG signal over the repetitions. The 95th percentile, peak and sum dependent variables for both sEMG and torque across all repetitions, sets and subjects were then used to evaluate the validity and reliability of the new wearable system (Athos) as compared to the gold standard research grade sEMG system (Biopac). We evaluated two measures of validity between Athos and Biopac. First, we compared the characteristics of the RMS sEMG signal for each muscle, speed, and percent MVC between the two systems. Secondly, we compared the strength and directionality of the relationship between sEMG metrics and torque output between Athos and Biopac. To evaluate differences between sEMG metrics obtained from Athos and Biopac, we used a linear mixed model to evaluate if there was a significant effect of system (Athos or Biopac), session (2-7), speed, or percent MVC on each dependent variable extracted from the sEMG waveforms collected. We used post-hoc Bonferroni adjusted p-values for pairwise comparisons. This model was estimated separately for the three-dependent variables: 95th percentile, peak, and sum of each repetition within a set. The combination of the two quad muscles measured, vastus lateralis and vastus medialis, were summed as an additional muscle grouping for comparison. We evaluated differences in sEMG characteristics (95%, peak, and sum) by creating a linear mixed model ANOVA with subject, speed, and muscle as independent variables and sEMG metric (95%, peak, or sum) as the dependent variables between Athos and Biopac. The linear model was calculated using R (R core team) using the lme4 package (Bates et al., 2015). To assess the strength of the relationship between torque and EMG for both systems, we fit subject specific regressions of sEMG and torque output for each muscle and speed combination that spanned 50, 75 and 100% MVC torque. These all ended up producing linear relationships. Figure 4 shows an example for one subject and represents all extension repetitions spanning all MVC levels at 180 deg/s. Each point represents the 95th percentile sEMG dependent variable from vastus lateralis against the torque generated during a knee extension repetition. The EMG values were normalized to the maximal voluntary contraction at each speed for each subject. We examined differences in the relationship between torque and EMG by comparing the coefficient of determination between systems using a Wilcoxon-Rank_Sum Test due to non-normally distributed data. To assess reliability first the repetitions were constrained to within +/-10% of the mode torque for each subject, speed and effort combination. This was necessary to ensure day-to-day variations in EMG amplitude were not due to differences in torque output. During the test protocol a range of effort levels were measured by asking the subjects to perform the movement at 50%, 75% and 100% MVC torque. The reliability of the EMG metrics was then accessed by calculating the variation in repetition amplitude in two ways, first as the coefficient of variation (standard deviation divided by the mean), and second as the standard deviation of the normalized repetition amplitude. Metrics based on sEMG amplitude are often normalized and presented as a relative measure against a baseline, such as one repetition maximum (Merletti et al., 1997; Farina et al., 2014). This allows the sEMG metric to be presented as a percentage of baseline contraction. The second approach provides a measure of variability as a percentage of MVC amplitude. The reliability measures were calculated using the 95th percentile repetition amplitude per muscle group for both Athos and Biopac. Reliability was also calculated for the sum of vastus lateralis and vastus medlias muscle groups. Validity The validity results comprise two main findings. First, there is not a significant main effect of system (Athos or Biopac) on sEMG characteristic (95%, peak, or sum) and the relationship between torque and EMG is not significantly different between Athos and Biopac. A 2-way mixed model ANOVA indicated significant main effects of speed (χ2 = 10.02, p = 0.005), but not of system (Athos or Biopac) (χ 2 = 0.65, p = 0.42) on sEMG amplitude. To be conservative, we performed post-hoc paired t-tests for each speed, muscle, and percent MVC combination and presented all significant differences in Figure 5. There was no significant difference for 95th percentile, peak, or sum sEMG metrics between Athos and Biopac (Bonferroni adjusted p > 0.001) for any speeds or muscles. A model between torque and sEMG was calculated between all sEMG metrics (95%, peak, sum), muscles and speeds separately and was statistically significant suggesting a significant linear relationship in our data set between torque and sEMG. The coefficient of determination ranged from 0.15 to 0.67 for all subjects. Critically, there was no significant difference in the strength of the relationship between systems (Wilcoxon Signed Rank p-values shown): 95% (BF: p = 0.41, VL: p = 0.45, VM: p = 0.63, VL+VM: p = 0.91), peak (BF: p = 0.42, VL: p = 0.22, VM: p =0.29, VL+VM: p = 0.56), and sum (BF: p = 0.64, VL: p = 0.21, VM: p = 0.29,VL+VM: = 0.09). Table 2 and Table 3 compare the strength of correlation between Athos/Biopac and torque. The first table shows the correlation for reps corresponding to 60 deg/s and the second for 300 deg/s. The two controlled speeds were used to represent both controlled strength and explosive power movements experienced in sport. Biopac shows on average a 4% higher correlation with torque. Both systems demonstrate a strong average correlation between sEMG and torque output across the 6 trials. Reliability The coefficient of variation of the 95th repetition amplitude across trials is shown in Table 4 at the 100% MVC level and each speed. The variation averaged across speeds is 0.8%, 7.3% and 0.2% higher for Athos for the bicep femoris, vastus lateralis and vastus medialis respectively. However, when the quads are summed together Athos demonstrates slightly lower variation at 19.9% compared to 20.4% for Biopac. As expected, the variability is higher at the higher speeds and the difference in variability between Biopac and Athos slightly increases at higher speeds. The standard deviation as a percentage of MVC amplitude is shown in Table 5. Biopac shows on average 10.7% variability and Athos 12% across all speed and MVC levels. Again, when the quads are summed together Athos demonstrates a greater decrease in variability compared to Biopac. The distribution of the variability as a percentage of MVC amplitude is represented with the boxplot in Figure 6. The boxplot whiskers show the 5th to 95th extents of the distribution. The average variation is represented with the line across each box and the lower and upper limits of the box represents the 25th and 75th percentiles of the variation distribution. We investigated the validity and reliability of the Athos sEMG system to characterize muscle activation patterns during isokinetic knee extension and flexion. We found strong consistency with a standard research grade EMG system (Biopac), a strong relationship between force output and normalized sEMG measurements from both Athos and Biopac, and moderate to high test-retest reliability of the Athos electrodes. Validity To assess validity of Athos compared to Biopac, we investigated differences in sEMG metrics at each speed, muscle, and percent MVC combination. There was no significant difference in signal repetition amplitude (95%, peak, or sum) measured between systems across all muscles measured. Based on a post-hoc power calculation using the standard deviation and mean values for each EMG metric and our sample size, we calculated a minimal detectable difference in EMG output of 0.3 standard deviations from the mean. It is unlikely that small differences (near 0.3 SDs) are significantly meaningful in an athletic setting. Lastly, differences in the alignment of the iliotibial tract and subcutaneous tissue composition may affect the individual quadriceps recording sites, while summing them removes most of this variability in EMG signal content. Therefore, it is remarkable both systems had no significant differences in normalized EMG output for any metric. There was no significant difference in the strength of the relationship between sEMG metrics and torque output between systems. In our data set, both Athos and Biopac sEMG metrics were linearly related to torque output longitudinally across the six trials and days. Correlation coefficients presented in Table 3 and Table 4 demonstrate a similar magnitude and directionality of correlation between sEMG and torque output for both systems, without a significant inter-system difference. The significant linear relationship and correlation coefficients demonstrate the ability for Athos to capture the same relationship between muscle activation and torque output over a range of speeds representing controlled and high velocity movements experienced in sport. Further, even at the highest speed, which represents dynamic movements experienced in sport, the strength of correlation between sEMG and torque was comparable between systems. The Athos electrodes do not use an adhesive to reduce electrode movement and corresponding artifact and yet the strength of correlation is comparable during high velocity movement. The comparable reliability between Athos and Biopac at higher velocities supports the efficacy for Athos to be used to measure dynamic sport movements without sacrificing measurement accuracy compared to a research grade system. It’s important to note that while the strength of correlation is comparable, 18% of sets were removed due to unreliable contact quality from at least one of the muscles measured with Athos. The sets removed primarily occurred at the start of the trial for a given day. One possible explanation is that in these cases the warmup was not sufficient to allow the impedance between the sensors and the skin to decline, thereby improving contact quality. This does emphasize that while Athos demonstrates comparable correlation during high velocity movements, this result was based on good contact quality sets only. A sufficient warmup and settling period may be required before valid and comparable measurements are provided. The relationship between sEMG amplitude and force output is still debated and likely depends on a number of factors including force output level and muscle physiology such as fiber type and size diversity (Alkner et al., 2000; De Luca, 1997; Lawrence and De Luca, 1983; Milner-Brown and Stein, 1975). While the relationship between absolute sEMG and force output is bi-linear between low and high-forces (Day and Hullinger, 2001; Keenan et al., 2005), the normalized sEMG and force relationship is approximately linear across the full range of force output (Fuglevand et al., 1993; Staudenmann et al., 2010). A review by Staudenmann et al. (2010) has concluded that although the relationship between sEMG amplitude and force is not necessarily linear for all muscle groups and applications, linear models are often inevitably used and provide a reasonable description of the relationship. Regardless of the linearity of this relationship through the entire range of muscle forces, there was no significant difference in the strength of this relationship between systems for the torque outputs measured. The results of this study support the conclusions of Staudenmann et al., (2010) for the muscles measured and protocol applied. We only tested from 50-100% MVC, and therefore likely experience amplitude cancellation from the bipolar recordings. Critically, because the EMG-torque relationship is not different between systems, any signal cancellation is similar between systems. Reliability There is not a statistically significant difference in reliability within or among sessions between Athos and Biopac. The coefficient of variation of sEMG amplitude is only 1% higher from Athos for both the bicep femoris and vastus medialis and 7% higher for vastus lateralis. sEMG reliability has been evaluated in previous studies, for example Yang and Winter (1983) evaluated the reliability of triceps sEMG amplitude during isometric contractions at 100%, 50% and 30% MVC across three days. To assess reliability, Yang and Winter (1983) processed the sEMG signal to generate a linear envelope. The amplitude of the linear envelope was compared across sets at each MVC level. The coefficient of variation in EMG amplitude at 100%, 50% and 30% MVC levels between days was 16.4%, 15.2% and 12.0%, respectively, while the variation within days was 9.1%, 8.5% and 10.3% (Yang and Winter, 1983). Results from the present study compare well with reliability reported by Yang and Winter (1983). For example, at 100% MVC and 60 deg/s, the coefficient of variation averaged across muscle groups was 20.1% from Athos and 18.6% from Biopac compared with 16.4% measured by Yang and Winter. The higher variability noted in this current study could be expected as we tested the variability of isokinetic contractions while Yang and Winter (1983) tested the variability of isometric contractions. It’s important to note that variability measured from any sEMG measurement includes measurement error, movement variability, and physiological variability. Measurement error includes variability introduced by the measurement system, such as noise caused by electrode movement during dynamic contractions and differences in electrode positioning, or the fact that the subjects were seated, and the hamstring electrodes may have been compressed between the seat and the leg. Movement variability is introduced by differences in how the subject performs the movement, differences in body position causing differences in muscle recruitment. Physiological variability is introduced by differences in the physiological state of the subject within a trial and between trials. The goal of this study was to examine the differences in measurement errors between the Athos and Biopac system, therefore every effort was made to reduce the movement and physiological variability. The movement variability was reduced by using an isokinetic dynamometer and following strict manufacturer’s recommendations in setting the subject up before every trail. Physiological variability was reduced by testing each subject at the same time on subsequent days, maintaining consistent rest periods between sets and having subjects note their sleep, hydration, nutrition, and exercise between each testing session. The individual components of the variability cannot be separated, but by comparing Athos and Biopac we can interpret differences between the measurement errors of each system and evaluate the performance of Athos as compared to a traditional research grade EMG system. We expect movement and physiological variability to have equivalent impact on Athos and Biopac data and therefore differences in variability should reflect differences in measurement error of the two systems. The small difference in overall measurement variability between Athos and Biopac suggests that Athos does not introduce significant measurement variability despite the form factor of the Athos system. Athos electrodes are built into compression apparel reducing complexity and setup cost by not requiring adhesive electrodes to be re-applied after each trial, careful skin preparation and additional reference electrodes. While Athos EMG measures compare well with those of a research grade EMG system, there is a moderate day-to-day variability inherent to EMG recording that is influenced by the measurement error, movement and physiological variability described above. Even when movement is controlled, as in this study, there may be variability in muscle activation strategies across muscle groups that may influence the variability in amplitude from a specific muscle across trials. For example, in this study at 100% MVC a common activation pattern measured was an increase in left gluteus maximus and bicep femoris activation during right concentric knee extension. One explanation may be that the left gluteus maximus and bicep femoris are activated to generate torque about the hip to support additional force during higher knee extension loads and this may influence the activation and variability measured from the right quads. Further research is needed to understand how these different forms of variability would be represented on athletes outside of the lab and how it would influence comparisons for an athlete across training sessions. From this study it was demonstrated that in a controlled setting Athos has comparable reliability to a research grade system. Based on this result, Athos has the potential to measure the movement and physiological variability outside of the lab without introducing measurement error as compared to a research grade system; although this requires further testing to confirm. The ability to collect valid and reliable sEMG information in any setting can be a valuable tool in understanding how athlete’s movement and physiology is changing across training sessions. 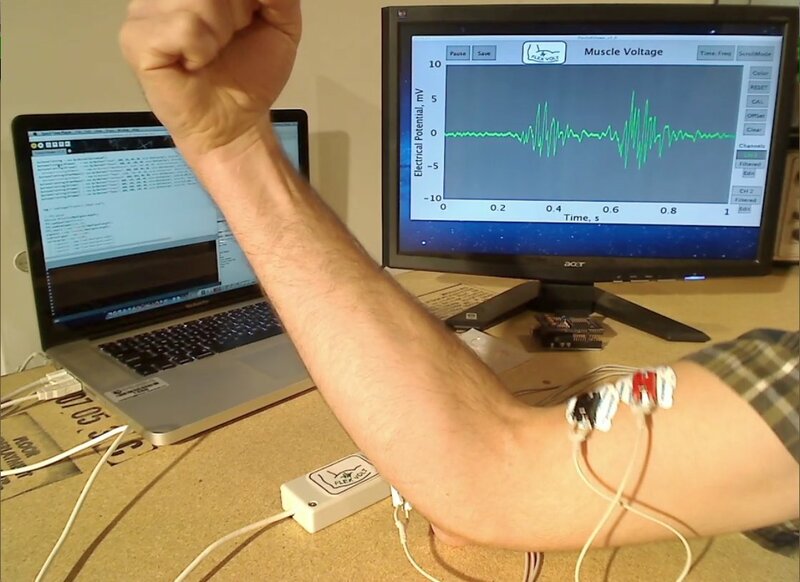 This may also have clinical and ergonomic uses in tracking muscle activation patterns in patients and workers during work tasks and activities of daily living. This study has demonstrated that over a range of dynamic contractions Athos provides measures of sEMG that are consistent with controlled, research grade technologies and techniques. There were no significant differences between normalized EMG amplitude or in the strength of the relationship between sEMG and torque output between Athos and Biopac. Also, no significant differences were seen in variability between Athos and the research grade system. The close comparison demonstrates that Athos does not add significant measurement error that limits application compared to the research grade system. The overall variability measured from both Athos and Biopac contains multiple components. The goal of Athos is to surface the physiological and performance variability down to individual muscles and to do so not just in the lab, but across an athlete’s training in the weight room, training room and on the field, pitch, court or track. Many studies have looked at the efficacy of applying sEMG measurements in sport (Clarys and Cabris, 1993; Draper, 1990; Snarr 2017; Zeller 2003). Further research is needed to study the use of sEMG in different applications and to understand how to interpret the data in less controlled scenarios, outside of the lab. This study has evaluated the Athos system in terms of validity and reliability and has demonstrated the efficacy of Athos as compared to a research grade system to support furthering research and application of sEMG both in and out of the lab. ACKNOWLEDGEMENTS The authors would like to acknowledge all those that participated in the study. Three of the authors (Lynn, Balfany, Feeney) are consultants for the company who make the wearable EMG device (Mad Apparel Inc., dba Athos). The other authors have no conflicts of interest to declare. All experiments comply with the current laws of the country. REFERENCES Alkner B.A., Tesch P.A., Berg H.E. (2000) Quadriceps EMG/force relationship in knee extension and leg press. Medicine and Science in Sports and Exercise 32, 459-463. Aquino J., Roper J.L. (2018) Intraindividual variability and validity in smart apparel muscle activity measurements during exercise in men. International Journal of Exercise Science 11, 516-525. Bates D., Maechler M., Bolker B.M., Walker S.C. (2015) Fitting linear mixed-effects models using lme4. Journal of Statistical Software 67, 1-48. Bloom R., Przekop A., Sanger T.D. (2010) Prolonged electromyogram biofeedback improves upper extremity function in children with cerebral palsy. Journal of Child Neurology 25, 1480-1484. Callaghan J.P., Gunning J.L., McGill S.M. (1998) The relationship between lumbar spine load and muscle activity during extensor exercises. Physical Therapy 78, 8-18. Clarys J.P., Cabri J. (1993) Electromyography and the study of sports movements: a review. Journal of Sports Sciences 11, 379-448. Cochrane K.C., Coburn J.W., Brown L.E., Judelson D.A. (2014) Effects of diverting activity on strength, electromyographic, and mechanomyographic signals. Journal of Strength and Conditioning Research 28, 1203-1211. Daley H., Englehart K., Hargrove L., Kuruganti U. (2012) High density electromyography data of normally limbed and transradial amputee subjects for multifunction prosthetic control. Journal of Electromyography and Kinesiology 22, 478-484. Day S.J., Hulliger M. (2001) Experimental simulation of cat electromyogram: evidence for algebraic summation of motor-unit action-potential trains. Journal of Neurophysiology 86, 2144-2158. DeLuca C.J. (1997) The use of surface electromyography in biometrics. Journal of Applied Biomechanics 13, 135-163. Dideriksen J.L., Feeney D.F., Almuklass A.M., Enoka R.M. (2017) Control of force during rapid visuomotor force-matching tasks can be described by discrete time PID control algorithms. Experimental Brain Research 235, 2561-2573. Draper V (1990) Electromyographic biofeedback and recovery of quadriceps femoris muscle function following anterior cruciate ligament reconstruction. Physical Therapy 70, 11-17. Farina D., Merletti R., Enoka R.M. (2014) The extraction of neural strategies from the surface EMG: an update. Journal of Applied Physiology 117, 1215-1230. Finni T., Hu M., Kettunen P., Vilavuo T., Cheng S. (2007) Measurement of EMG activity with textile electrodes embedded into clothing. Physiological Measurement 28, 1405-1419. Fuglevand A.J., Winter D.A., Patla A.E. (1993) Models of recruitment and rate coding organization in motor- unit pools. Journal of Neurophysiology 70, 2470-2486. Herrington L (1996) EMG biofeedback: What can it actually show?. Physiotherapy 82, 581-583. Kalytczak M.M., Garcia Lucareli P.R., do Reis A.C., Bley A.S., Biasotto-Gonzalez D.A., Ferrari Correa J.C., Politti F. (2016) Kinematic and electromyographic analysis in patients with patellofemoral pain syndrome during single leg triple hop test. Gait & Posture 49, 246-251. Kaur G., Kumar P. (2016) Compare the effectiveness of EMG biofeedback assisted core stability exercises versus core stability exercises alone on pain and disability in patients with low back pain. International Journal of Physiotherapy 3, 376-380. Keenan K.G., Farina D., Maluf K.S., Merletti R., Enoka R.M. (2005) Influence of amplitude cancellation on the simulated surface electromyogram. Journal of Applied Physiology 98, 120-131. Krause D.A., Jacobs R.S., Pilger K.E., Sather B.R., Sibunka S.P., Hollman J.H. (2009) Electromyographic analysis of the gluteus medius in five weight-bearing exercises. Journal of Strength and Conditioning Research 23, 2689-2694. Lawrence J.H., De Luca C.J. (1983) Myoelectric signal versus force relationship in different human muscles. Journal of Applied Physiology: Respiratory, Environmental and Exercise Physiology 54, 1653-1659. Luc B.A, Harkey M.H., Arguelles J., Blackburn T., Ryan E.D., Pietrosimone B. (2016) Measuring voluntary quadriceps activation: Effect of visual feedback and stimulus delivery. Journal of Electromyography and Kinesiology 26, 73-81. Lynn S.K., Costigan P.A. (2009) Changes in the medial-lateral hamstring activation ratio with foot rotation during lower limb exercise. Journal of Electromyography and Kinesiology 19, e197-205. Lynn S.K., Noffal G.J. (2012) Lower extremity biomechanics during a regular and counterbalanced squat. Journal of Strength and Conditioning Research 26, 2417-2425. Matheve T., Brumagne S., Timmermans A.A.A. (2017) The effectiveness of technology-supported exercise therapy for low back pain: A systematic review. American Journal of Physical Medicine & Rehabilitation 96, 347-356. Merletti, R., Wallinga, W., Hermens, H.J. and Freriks, B. (1997) Guidelines for reporting SEMG data. In: The state of the art on sensors and sensor placement procedures for sur- face electromyography: a proposal for sensor placement procedures, deliverable of the SENIAM project. Published by Roessingh Research and Development bv. ISBN 90-75452-15-2. Michener L.A., Sharma S., Cools A.M., Timmons M.K. (2016) Relative scapular muscle activity ratios are altered in subacromial pain syndrome. Journal of Shoulder and Elbow Surgery 25, 1861-1867. Milner-Brown H.S., Stein R.B. (1975) The relation between the surface electromyogram and muscular force. Journal of Physiology 246, 549-569. Park Y.K., Kim J.H. (2017) Effects of kinetic chain exercise using EMG-biofeedback on balance and lower extremity muscle activation in stroke patients. The Journal of Physical Therapy Science 29, 1390-1393. Pascoe M.A., Holmes M.R., Stuart D.G., Enoka R.M. (2014) Discharge characteristics of motor units during long-duration contractions. Experimental Physiology 99, 1387-1398. Roberts D., Kuenze C., Saliba S., Hart J.M. (2012) Accessory muscle activation during the superimposed burst technique. Journal of Electromyography and Kinesiology 22, 540-245. Snarr R.L., Hallmark A.V., Casey J.C., Esco M.R. (2017) Electromyographical comparison of a traditional, suspension device, and towel pull-up. Journal of Human Kinetics 58, 5-13. Staudenmann D., Roeleveld K., Stegeman D.F., van Dieen J.H. (2010) Methodological aspects of SEMG recordings for force estimation – A tutorial and review. Journal of Electromyography and Kinesiology 20, 375-387. Walker S., Davis L., Avela J., Hakkinen K. (2012) Neuromuscular fatigue during dynamic maximal strength and hypertrophic resistance loadings. Journal of Electromyography and Kinesiology 22, 356-362. Yang J.F., Winter D.A. (1983) Electromyography reliability in maximal and submaximal isometric contractions. Archives of Physical Medicine and Rehabilitation 64, 417-420. Zeller B.L., McCrory J.L., Kibler W.B., Uhl T.L. (2003) Differences in kinematics and electromyographic activity between men and women during the single-legged squat. American Journal of Sports Medicine 31, 449-456.